I had the joy recently of collaborating with fantastic illustrator/animator Gary Mayes. Whilst preparing for a job we realised that we had a little time and it would be beneficial for us to do a little ‘test’, what better way than to wish you all a ‘Happy New Year’ ?! I drew approx. 150 frames which then Gary took away and worked his magic. 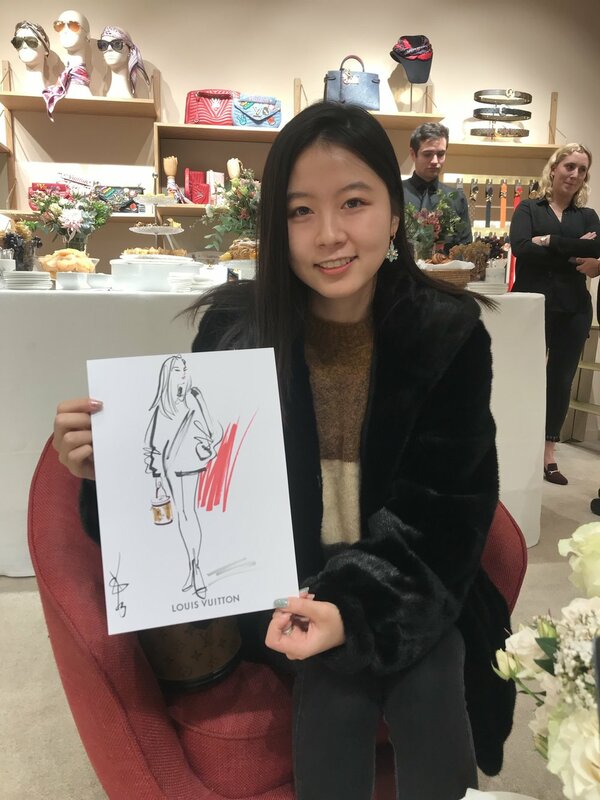 I had the pleasure a couple of weeks before Xmas to sit in Louis Vuitton’s Sloane Street Boutique whilst special customers did their Xmas shopping, trying on the latest collection of LV bags, scarves, shoes and clothing from their Winter collection. 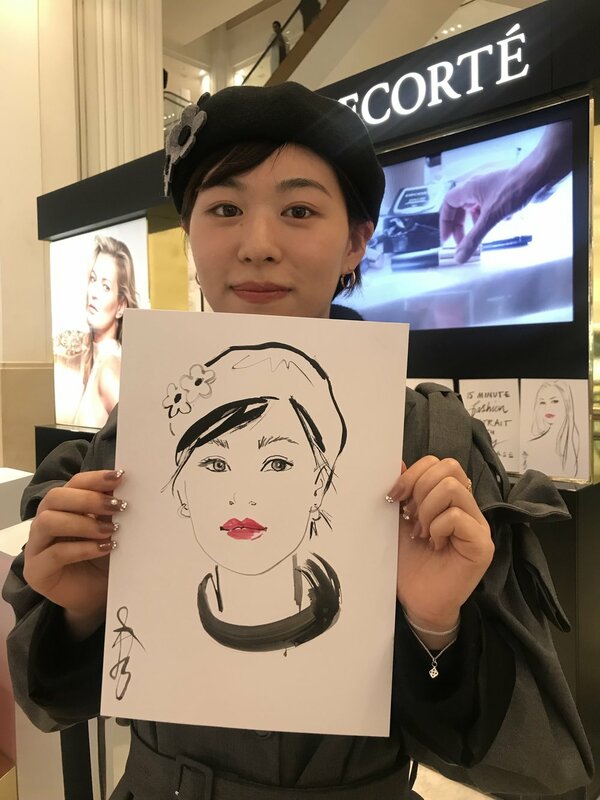 I decided to use brush pens at this event for the first time due to the cream carpet. I’ve never actually spilt any ink at an event but as there were children and even dogs present, I decided to ‘play it safe’! 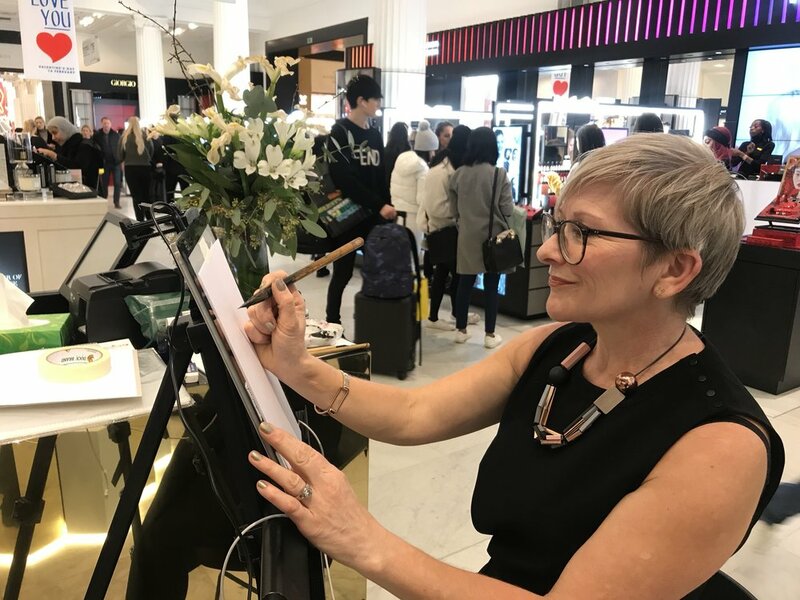 It made or a challenging morning but I really enjoyed chatting with the guests and their families whilst sketching away- a great Christmas vibe in Knightsbridge! 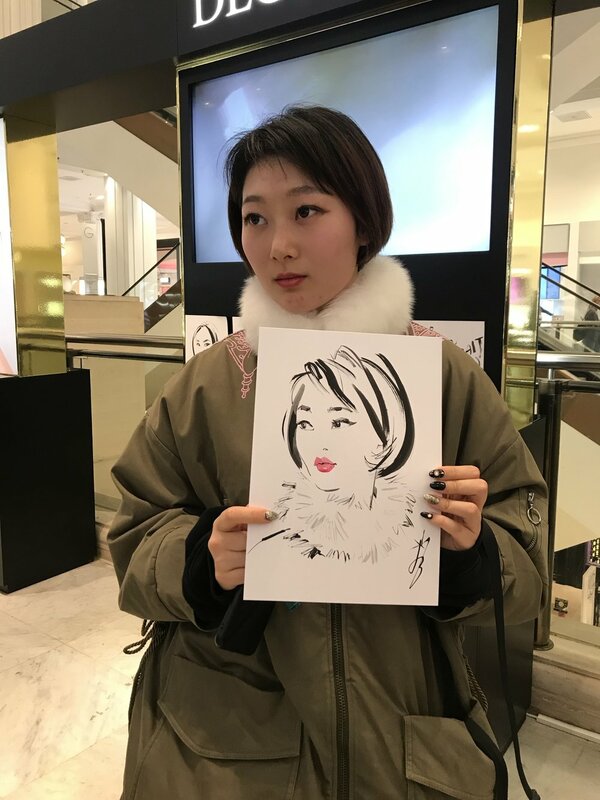 Live drawing at a totally unique location! Yesterday I drove up to Banbury to draw guests at Aynhoe Park for Pragnell Jewellers. 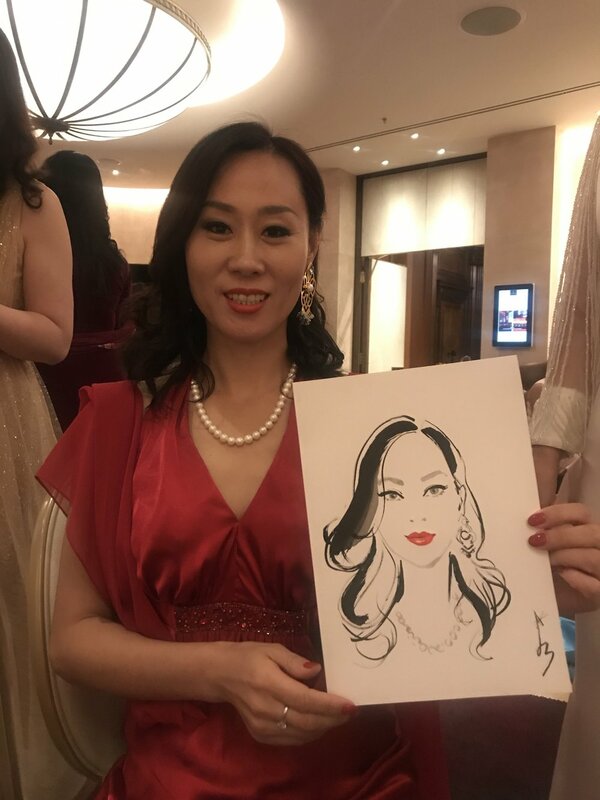 Booked by Susannah at Couture Events to draw at a lavish party for their loyal customers. 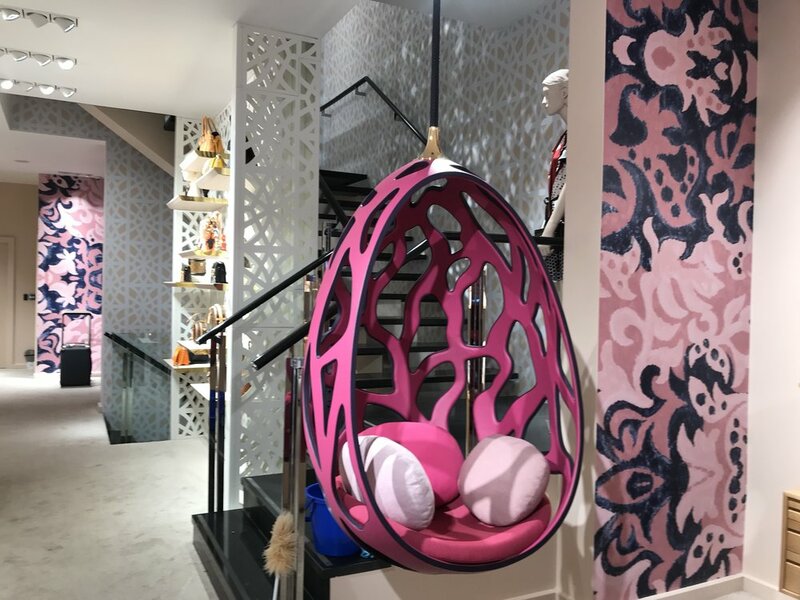 Pragnell’s is a family owned business with stores in Leicestershire and Mayfair as well as their flagship store in Stratford-Upon-Avon. 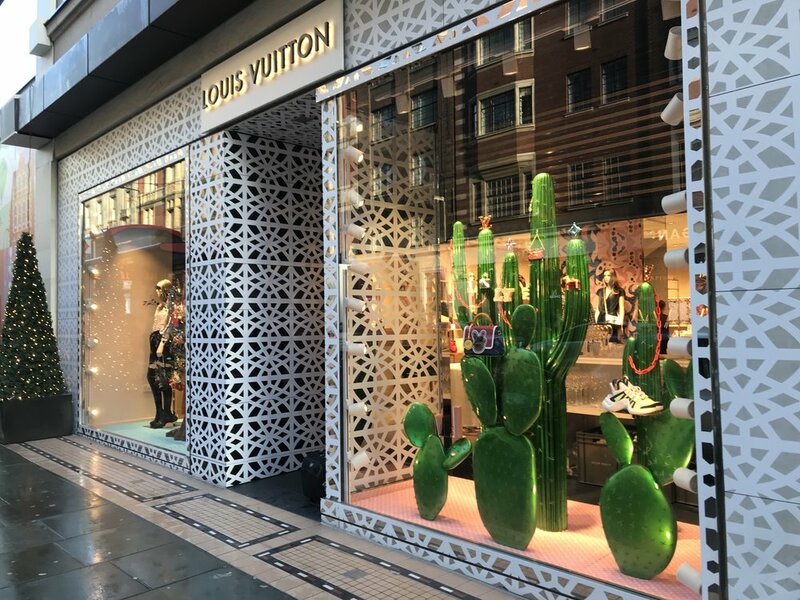 They sell the most exquisite jewellery, made in house by master craftsmen and sold alongside luxury watches such as Cartier, Rolex, Patek Philippe. The orangery at http://aynhoepark.co.uk where I worked sketching guests, was adorned with taxidermy leopards, a toucan and a giraffe, seemingly being lifted by gigantic porcelain balloons. It really was the most ostenatious location that I’ve ever had the pleasure to work in! Out of the window next to me was a stunning view over the parkland which was full of deer. 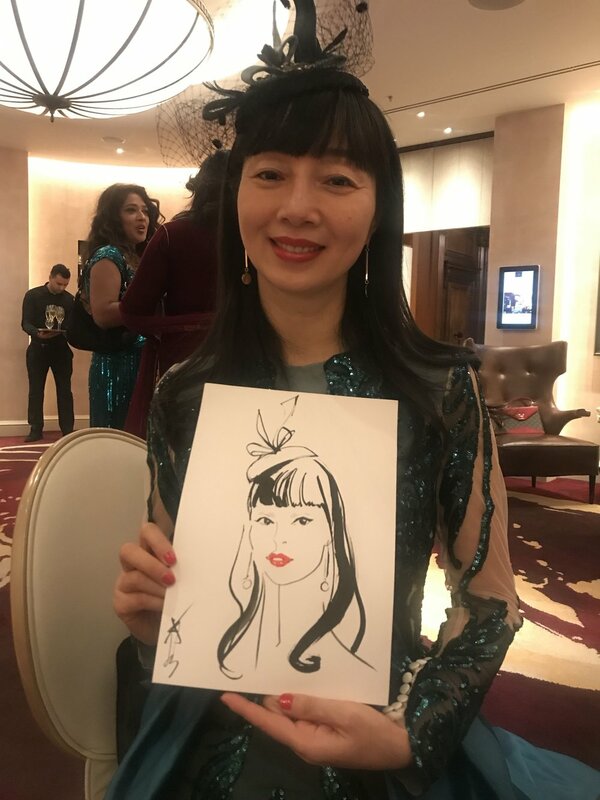 My guests kept spotting huge stags whilst I drew their portraits. It was a crazy busy 5 hours with barely time to change my paint water, but a thoroughly enjoyable day! 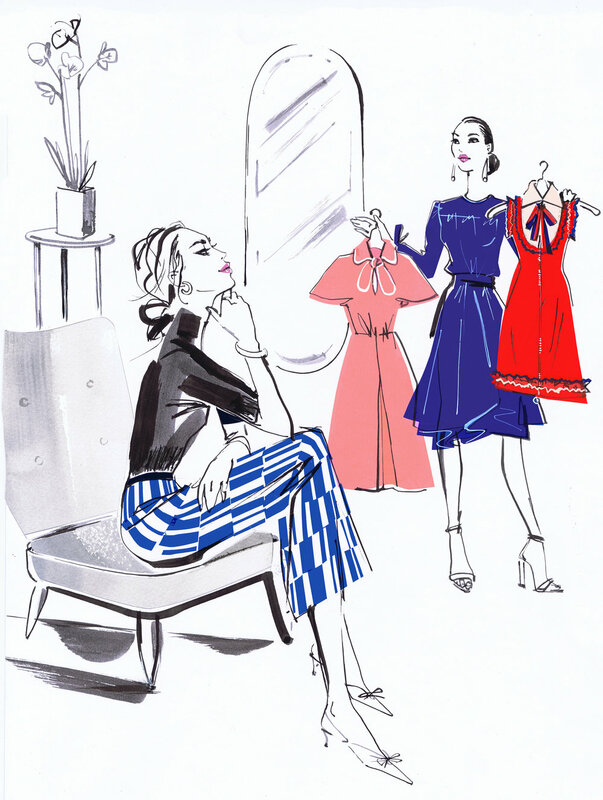 Jacqueline was recently commissioned by the online retailer of gorgeous luxury clothing and accessories from Balenciaga, Prada, Gucci and other leading designers’ latest collections. 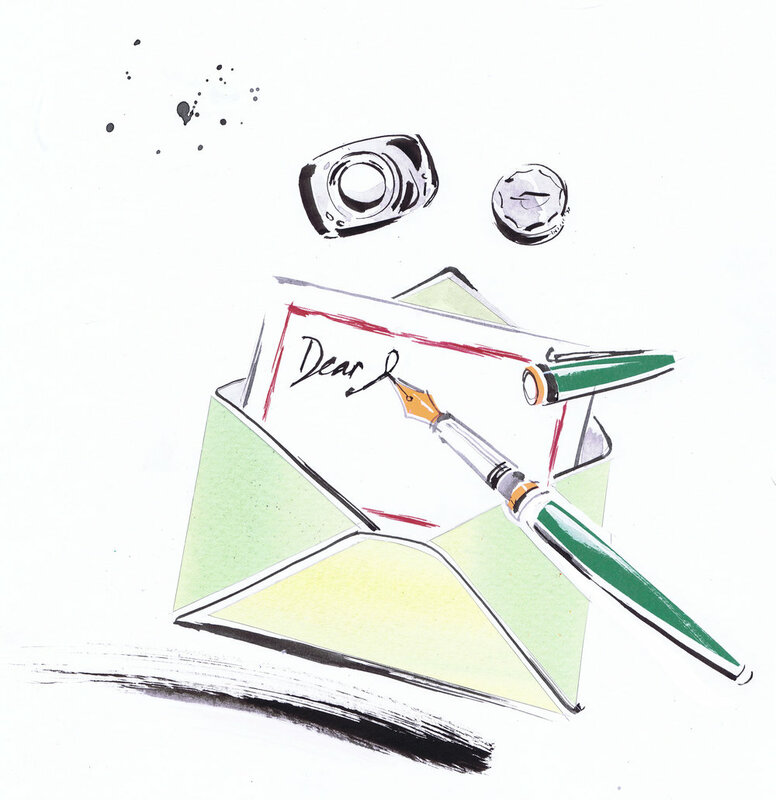 ‘Inner Circle’ and ‘Front Row’ customers from this month will receive beautifully illustrated newsletters, invitations to fashion shows and personal shopping events. I’ve been with illustration ltd for over 10 years and in this time I’ve seen my workload grow. The variety of commissions that the lovely team bring in from all over the world, is really exciting. 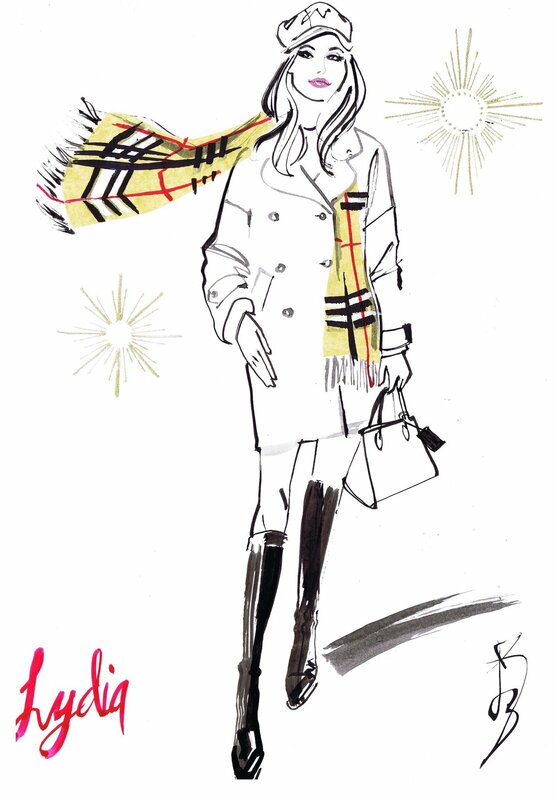 I’ve had jobs that have taken me to LA, Qatar, Bahrain, St. Moritz and Paris many times. During last week my illustrations ‘took over’ illustrationweb’s Instagram page and they featured me on Twitter and Facebook. 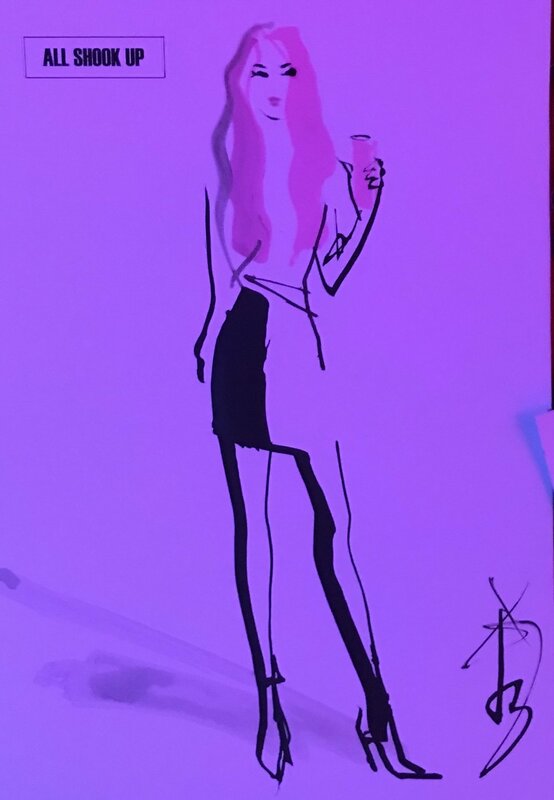 Last week The Cuckoo Club hosted a club night for All Shook Up's Flamingocolada, Jacqueline painted guest portraits whilst they enjoyed the new cocktail. 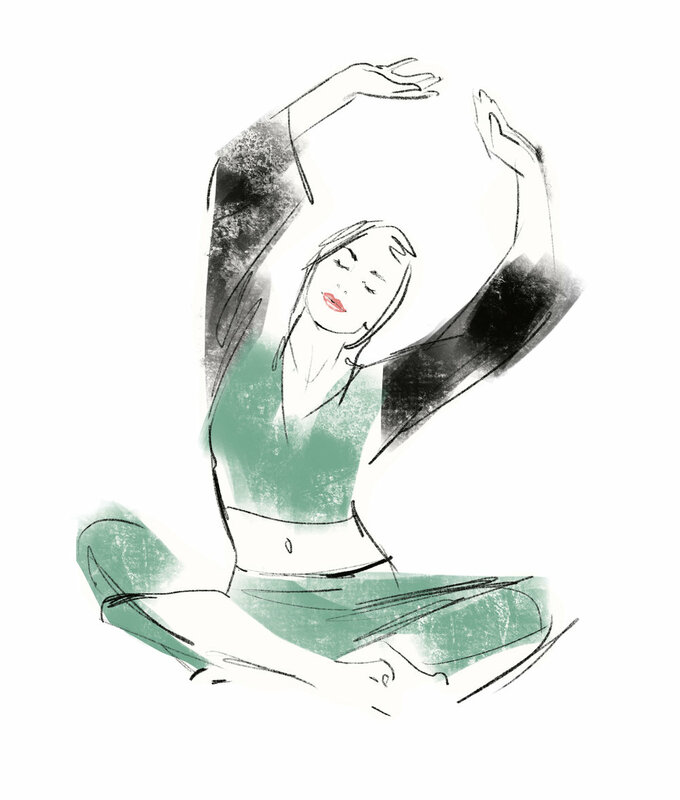 It was an evening of challenges for Jacqueline, drawing A5 full length fashion portraits in very low and colourful lighting but a lively, atmospheric event with some great ‘models’! Jacqueline prepared a sample before the event so at least she could be ready to sketch. 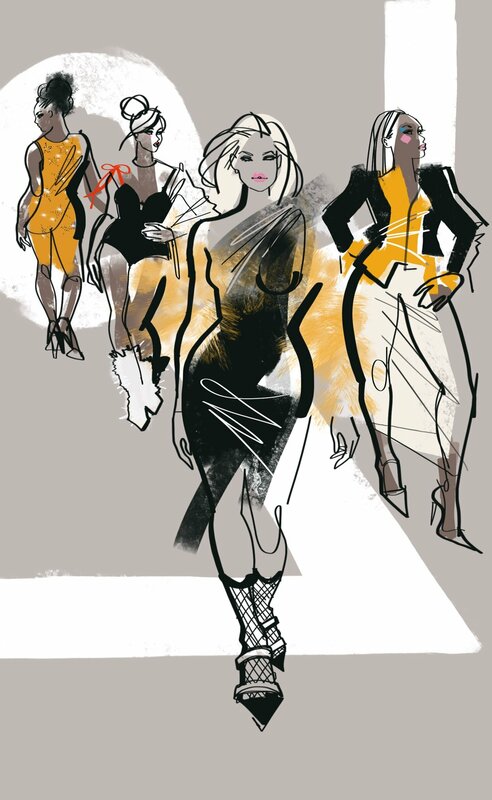 I was recently commissioned by the luxury travel brand Four Seasons to illustrate in the Fashion issue of their third issue. 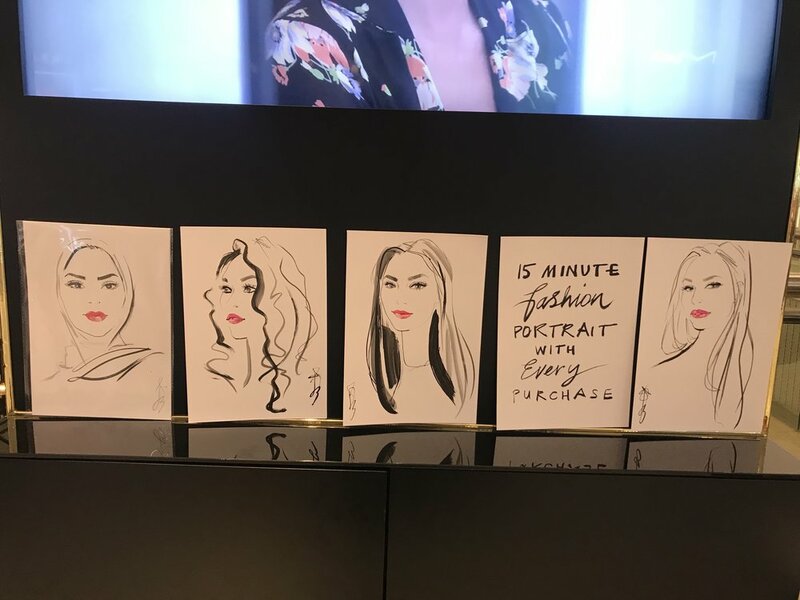 Articles to illustrate included a fascinating read by SC Stuart showing the impact of Artificial Intelligence on fashion design and where the future is taking us, by keeping a track and logging information on existing designs/trends. The next feature by Amanda Mull was on catwalk representation of women of many physical abilities and sizes. Finally I was asked to give my opinion on present fashion trends and for my take on reinvented designs from leading brands’ archives. I decided to work digitally on the iPad Pro, which is still a lesser area of my work, the suitability for the articles seemed most relevant. It’s always good to have some editorial work as a freelance illustrator as this is still our best showcase, seeing one’s work in print. 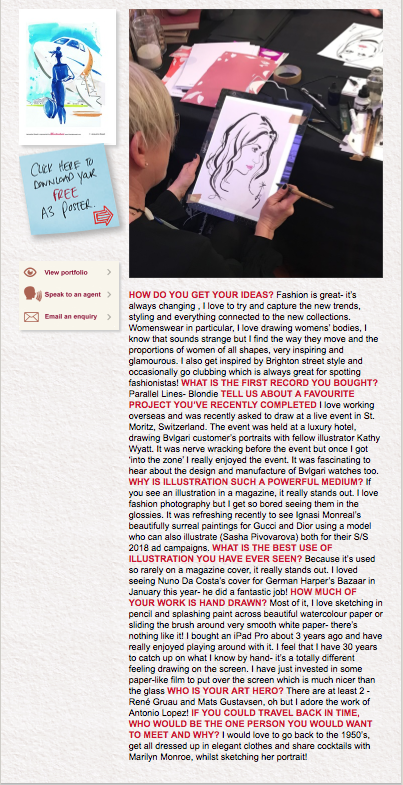 Jacqueline and Kathy Wyatt team up to illustrate guest portraits for Bvlgari in St. Moritz, Switzerland. I had a very exciting day last week at Soho House's Festival at Kenwood House. It was a hot day and my first time working at a festival outdoors. Luckily I had a shady spot on the edge of Private Drama's marquee where I was able to cast an odd glance at the amazing acts of circus-style performers. Their theme was very much 'The Greatest Showman' Vaudeville style with traditional acts being off-centred and updated, I felt honoured to be a part of their very grand marquee. I had a great time over the Royal Wedding weekend, working on the first floor of the beautiful Regency building. Staff were very welcoming and it was great to work in a place with a lovely 'family feeling'! The glitzy opening evening was attended by the fashion glitterati who came to listen to Ginnie Chadwyck-Healey who gave a fabulous talk on the styling of Ralph's new collection. The following 3 days I spent linked up to a large monitor where guests were invited to try on the new collection, styled by the staff. 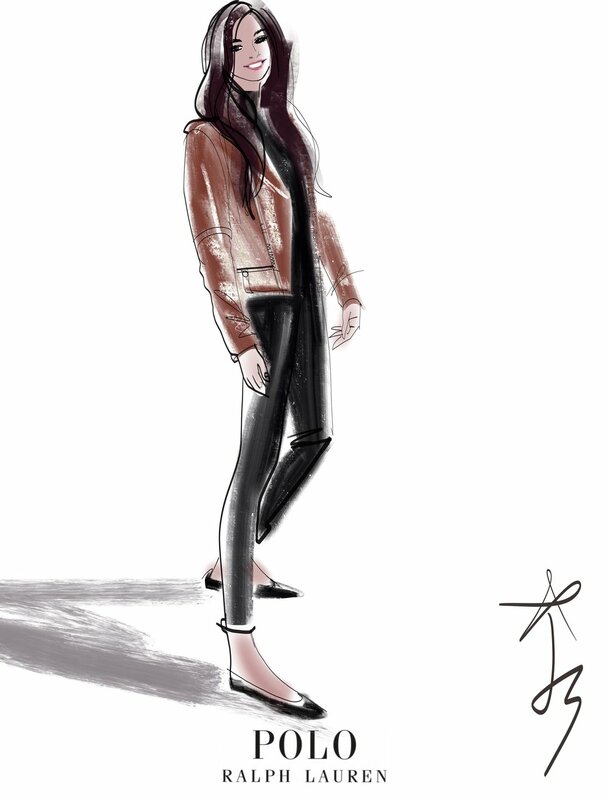 I then sketched them on my iPad Pro, emailing the illustrations directly to them. Had a lovely commission nearly 2 years ago to illustrate the cover for this book, it was then shelved for a year and when it returned, the cover was changed slightly and internal illustrations were added to each chapter. It's a really fun, playful read of Mohammadi's relocation to Florence and an insightful journey into this new world after a busy career, writing in London. 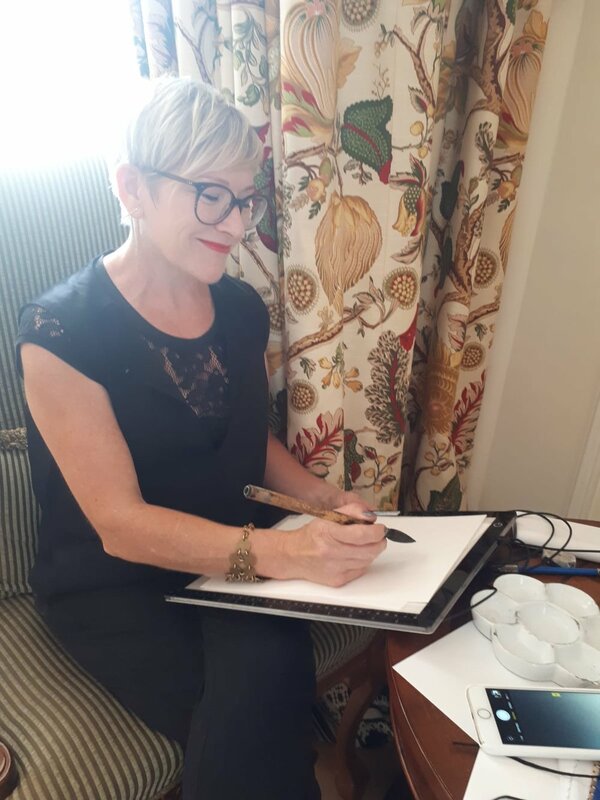 The morning started with Jacqueline sketching the bridal party including bridesmaids, her parents and the bride herself in the wonderful penthouse suite of Claridges Hotel in London. It was lovely to get caught up in the excitement whilst the girls were readying themselves for the glamorous wedding in Kensington. I started sketching at 11am and worked all day whilst the happy couple were getting married. Greeting them on their return downstairs in Claridges beautiful ballroom where I continued until 11pm illustrating guests during the cocktail reception and continuing whilst they dined. It was an exhausting day as I normally only work in 3-4 hour stints but lovely to be part of such a happy occasion! Queen Rules- 2 day 'live' event in the fabulous ad agency FCB Inferno for the launch of 'Queen Rules'. A great idea to change the King over to the Queen as the highest ranking card- after all we have had one as our longest reigning monarch ever! Now why don't we have a United Queendom??? (thank you Toni Brennan for this insightful suggestion!) I was asked to draw a list of celebrities to engage with people on social networks and television. Working from photos so not exactly a 'live event' but working in situ in their amazing offices in Covent Garden opposite the Old Bailey was great fun. 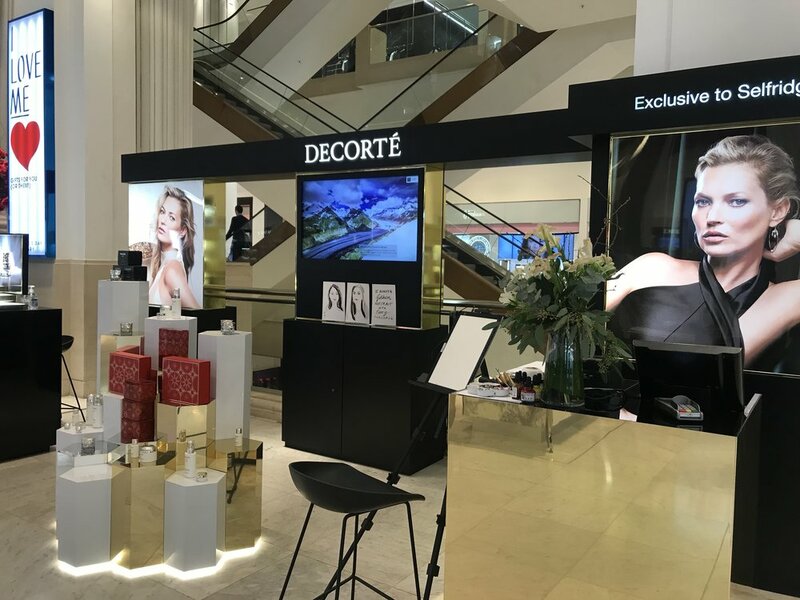 Another City, another Emporio Armani event for Jacqueline. Linking up her iPad Pro to a 2 metre high screen, this customer evening event was a huge hit with customers and local bloggers. Jacqueline felt really at home as this is the city near where she grew up and went to Bournville College of Art, embarking on her fashion career. Little did she know 30+ years ago that she would end up working for such luxury brands as Giorgio Armani. The fabulous designer shopping centre The Mailbox is a great place for shopping and eating, hosting this wonderful champagne and canapéd event. 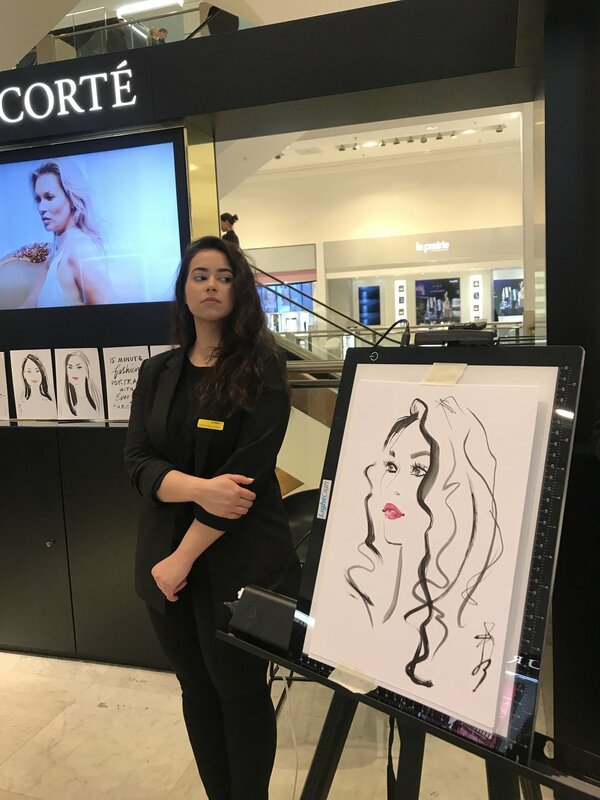 Jacqueline's next event was also for a luxury brand jeweller, this time in Selfridges for Bulgari. In April Jacqueline flew to Paris to meet her Paris agent Marie Bastille (www.mariebastille.com). 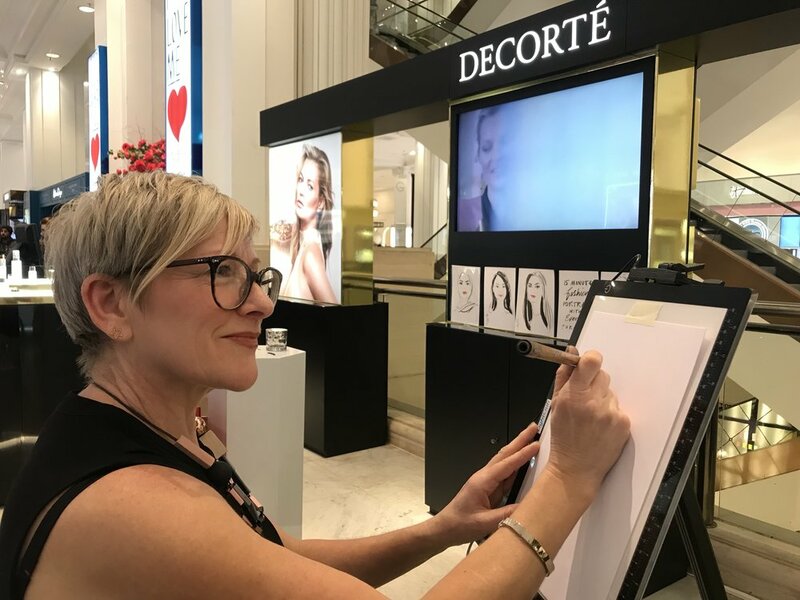 An early start at De Beers and a very long day sketching, first of all press and then customers at the launch of their wedding collection. 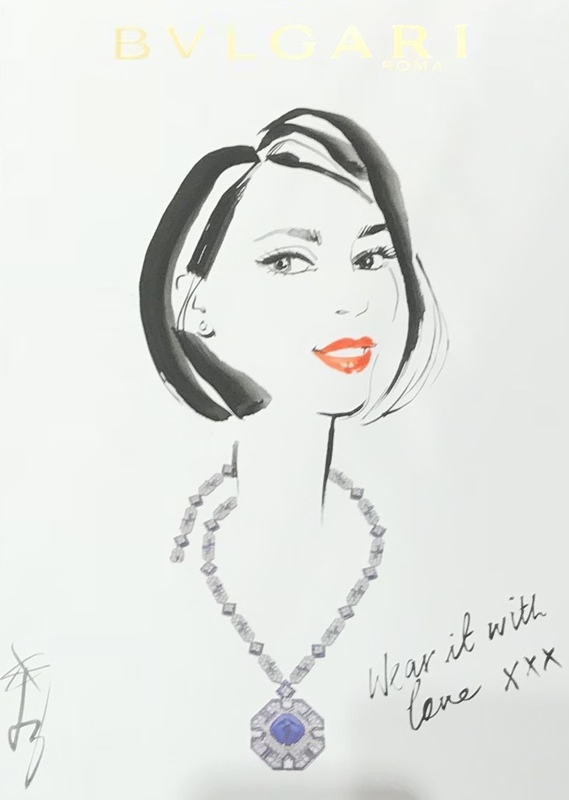 Jacqueline sat amongst beautiful diamond engagement, wedding and eternity rings, it was the perfect atelier for the day- it was an unusual job as DeBeers wanted pencil sketches with a little soft pink watercolour to show off the diamonds. Diamonds are definitely a girl's best friend!